This is the first time I have ever seen this error. 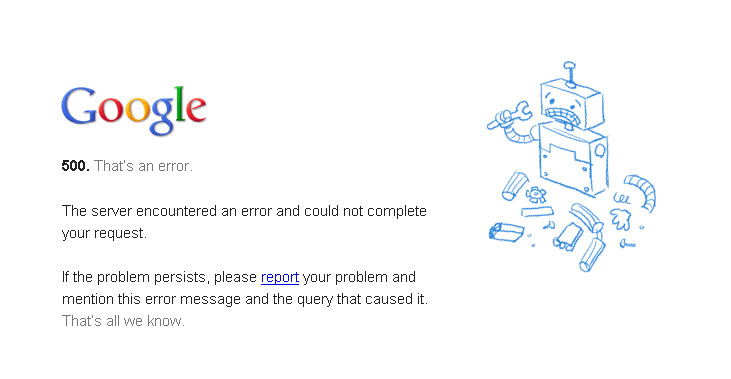 I can only assume it means that I killed google, for which I am sorry. They were very helpful. I assume that naming the error 500 refers to the number of my private emails the survivors of the aforementioned google apocalypse will publish, or the number of surviving googlers that will come after me in my sleep tonight. Or, maybe it just means I am the 500th person in history to access this error. That would make me feel special. I am going to refresh my google search and see if they have recovered. If you don’t hear from me in a week, tell the feds google got me. Oh no, Blake! How could you?! We are so disappointed. You will be hearing from our lawyers.